Hatters skipper Scott Cuthbert felt that the manner in which Town fought back to earn a point at Coventry City on Tuesday night is a clear demonstration of the desire within the squad to win promotion this term. 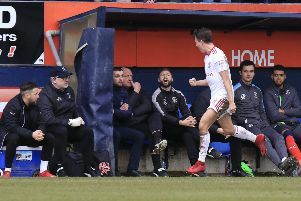 The visitors had been trailing 2-0 at half time after delivering a poor performance, with Marc McNulty’s goal just before the break appearing to be a hammer blow. However, against the side with the best defensive record in League Two, Luton pulled one back through Cuthbert’s header, with James Collins then equalising on 88 minutes. Cuthbert said: “For as long as I can remember this season we’ve been beating teams four, six, seven, eight, dominating games, making teams coming in after the game like we did on Saturday (against Accrington) feeling so low because we’ve been so dominant and so good. “We’re going through a little tricky spell and we said at half time and before the game, we either go into a corner, cry about it, start making all the excuses in the world, or you roll your sleeves up and you get on with it. “You stand up and be counted for and that’s what we did and that shows the signs of a good team, or a team that want to be champions, that want to do something. The captain was making his first start since suffering a bad groin injury against Cambridge back in November and admitted it was a far from ideal opening to fall behind to Peter Vincenti’s volley on just three minutes. He said: “I’ve not played a game in about 14 weeks and I thought first 15 minutes just feel your way in and within three minutes you’re 1-0 down and you think ‘oh my god’. “We’re massively disappointed with the way we played first half. We didn’t get near them for large parts, when the ball went up, never held it up, when the ball went up to them, it was too easy for the two strikers to come off, too easy for the midfielders to come off, have shots. “We conceded two bad goals from our point of view, but we showed so much character and so much belief, rolled our sleeves up, second half were brave, tried to play and got our just rewards. It was Cuthbert who got the ball rolling too, rising highest to nod Alan Sheehan’s deep free kick in for his second goal of the season and he was well aware of the importance of the strike, saying: “We knew that the next goal was massive. “If they’d scored us, they’d have put us to bed and killed the game off, so it was great ball in from Sheesy, the goalie’s came for it and I’ve managed to put it in. “I’m delighted and we got a bit of momentum, I felt like we were the better side, got the goal late on and maybe a little bit disappointed last five minutes that Stechy’s (Marek Stech) had to make a save. “We should be maybe a little bit smarter and maybe seen the game out a bit better, but that’s just the kind of way that we play. Striker James Collins was impressed with the manner of Cuthbert's return too, adding: "I thought Scott was excellent in his first game back from a long injury. "You know what you're going to get from him, he's a leader, he wins a headers and he's always a threat in the opposition box from set-pieces, so I'm delighted for him to get his goal."